I recently finished a website project, and I wanted to talk about why I think something like this is important for a new business. Also, I want to brag on my client because she is pretty darn awesome. First, the project: My client is a psychologist who has been in practice for 30 years. 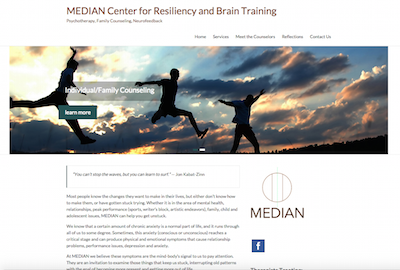 She founded the MEDIAN Center for Resilience and Brain Training to expand her practice to include NeurOptimal brain training (I won’t go into what that is; the website explains it). She is providing a valuable service but really needed help figuring out how to talk about it. She also knew—and this is critical—that in this first year, her model may change a bit. The understanding that how she thinks the clinic will operate today will likely change within the next year is so important, and I love that she recognizes it. I see so many coaches, therapists, and consultants launch their small business without understanding this. So what happens is they either don’t have a website at all for a year or they invest a TON of money developing a gorgeous website that is obsolete in six months because they changed direction. Neither of those is a great option. My advice is to do a Phase 1 website. This is a brochure style website that has a very specific purpose: to legitimize your business. It provides the information people need to understand what you can do for them. And that is all. It is not perfect. It will not be the website you have for five years. What it will do is give you that tool that you must have as you are starting out. Digital marketing/SEO folks won’t agree with this advice because a site like this is not what you would use to drive traffic to a website or build your list (or even really optimize for search). They are right. My argument is that at this stage of your new business, you aren’t ready for that. Today, right now, you need an online brochure. In a year, once everything has shaken out and you’ve gotten to know your business a little better, THEN you call in the digital marketers and the web developers. Then the investment in a Phase 2 site makes sense, and they will give you an amazing site—more so because you all have clarity about what the business is.